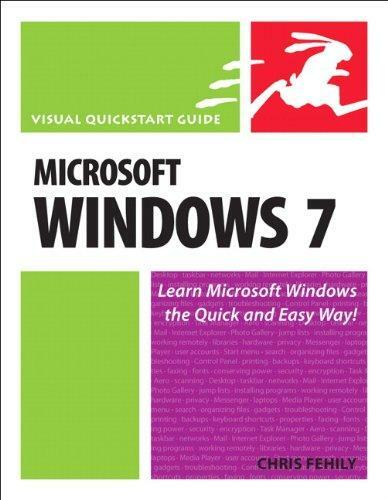 Today I am going to review the book Visual Quickstart Guide: Microsoft Windows 7, authored by Chris Fehily and published by Peachpit Press. There are always people out there that are new to computers, new to Microsoft operating systems, or just looking for basic information on how to use their PC. This book is aimed at those people. Let me start by saying that this book is very simple. Having said that, it is also extremely thorough, going through details on how to do what you need to do with Windows. It doesn’t skimp on the step by step instructions on how to do things. That’s the good part. This book goes through all the basic operations that you would need to operate your Windows 7 PC, from starting up, adding new users to using Windows Live Essentials (which is a free download, not included in the OS). It won’t make you an expert, but it will make you a knowledgeable computer user. Let’s see what this book has inside. It starts with an introduction to the OS, how to use the Start menu, logging on and off, the interface and other basic usage. From there it goes into the Desktop, how to customize it, change the background and icons. Following that, you have a chapter on where to go for help. Windows built-in help works great for a lot of things, but nearly anything and everything you may have a question about, someone online has an answer (probably many people have a few different answers or opinions!). Coming up next is how to customize your Windows 7 environment, organizing your files and folders, and installing and running programs. While these are very basic tasks, they are also essential to using your PC. If you aren’t comfortable with installing and running programs, there really is very little reason to own a computer. Following that is printing, scanning and faxing, which is a very common thing with PC’s. There are a few things that are different with Windows 7, some make things easier and others a bit more difficult, but this chapter makes it all understandable. After that, you get into adding hardware. Then comes the part that comes in handy: actually using your PC to get things done. Digital photos, Windows Media Player (and Windows Media Center), Windows Live Movie Maker (part of the Windows Live Essentials package) and the internet. They may be basic things, but they are something that you may use quite often. Then you get into the online section of the book, including security and privacy, Internet Explorer, Windows Live Mail (also part of WL Essentials) and Windows Live Messenger. You also learn about user accounts, setting up a small network (workgroup only, domains are definitely out of the scope of this book! ), and working remotely using Remote Desktop. The last chapter is dedicated to maintenance and troubleshooting. Using only 20 pages, it isn’t the thickest part of the book, mainly because it would take a book twice as thick to go through the detailed subject matter! An appendix is included that details how to do a basic install of Windows. There are a few issues I have with the book, the first one being the advocating of piracy. If you are installing Windows 7 and don’t qualify for an upgrade, you need to install a full version of Windows 7. But, according to the book, you’re better off buying the upgrade version and downloading a copy of XP or Vista from BitTorrent. This is definitely not a good suggestion, and I do not recommend doing that. There are copies of Windows online that aren’t exactly clean and contain spyware, malware and viruses. Another issues I have is the section where the author claims “Antivirus is a scam”. Yes, some of his arguments are true, but there is definitely no reason to not run an antivirus program. No matter how careful you are, watch what sites you visit: if you go online or share media, you are susceptible to viruses. I always recommend a basic antivirus at the very least. With many free options available that use very little resources, there is no reason not to. All in all, this book is great for very novice Windows users. It guides you through step by step to how to use most, if not all, of the features of the OS. While it doesn’t dig deep into the customization and tweaking of the OS, the target audience would have no use for it anyway. Most of the readers to this site are too advanced for this book, but it would be a good gift to anyone in the family with their first PC or someone that has just upgraded from Windows 95.